I started taking Elderberry Syrup for cold and flu prevention last winter when I was pregnant with my daughter because it’s full of vitamins and immune boosting antioxidants. I love to use natural products instead of over the counter medicine when I can because I feel it is better for my health and the health of my family. I knew I wanted to try making Elderberry Syrup at home this year because the store bought stuff is really expensive especially if you are taking it daily during cold and flu season. Last year I paid around $10 for an 8 oz bottle and I made it this year at home for a fraction of that price. I ordered my berries through Amazon, but you can also get them from Mountain Rose Herbs. Step 1: Simmer berries, spices and water in a sauce pot, stirring occasionally until liquid is reduced by half. This should take around 45 minutes. Step 2: Strain liquid into bowl and discard elderberries. This works best using something like a fine mesh strainer, coffee filter, sheer curtain, or fine cheesecloth. Step 3: Mix in honey and then add apple cider vinegar mixing well. Step 4: Pour into clean glass jar and refrigerate for up to 3 months. If sick, take the above dose every 2-3 hours as needed. Have you ever taken elderberry syrup? What kinds of natural remedies do you use for cold and flu prevention? I’d love to know! Disclaimer: I am not a medical professional. Please do your own research before taking home remedies. This is not intended to replace a professional opinion. Simmer berries, spices and water in a sauce pot, stirring occasionally until liquid is reduced by half. This should take around 45 minutes. Strain liquid into bowl and discard elderberries. This works best using something like a fine mesh strainer, coffee filter, sheer curtain, or fine cheesecloth. Mix in honey and then add apple cider vinegar mixing well. Pour into clean glass jar and refrigerate for up to 3 months. Standard Dose for Cold and Flu Prevention: 1 tsp daily for kids and 1 tbsp daily for adults If sick, take the above dose every 2-3 hours as needed. Yes, I have been meaning to try their tonic and post a similar recipe. I'm so glad that you've tried it and liked it! I LOVE this! My husband scavenged for loads of elderberries in local forests for me this fall. (Supposedly they are best if they go through a frost or two first and they had :) I made a couple batches and still have some berries in the freezer. I make mine with echinacea tea in it and then can it in a waterbath so that it is shelf stable. I used to make it for the referigerator but it doesn't last past a couple months there. Oh this is amazing, right up my alley! I love all kinds of berries and currants. I remember actually having an elderberry tree in front of the house where I grew up but that was many years ago and the internet wasn't available yet. I always knew that something could be made with elderberries but I didn't know what. Thank you for this article! Aren't berries just amazing? Oh my goodness...what can I say but THANK YOU all! These recipes, ideas and posts are so wonderful and helpful! 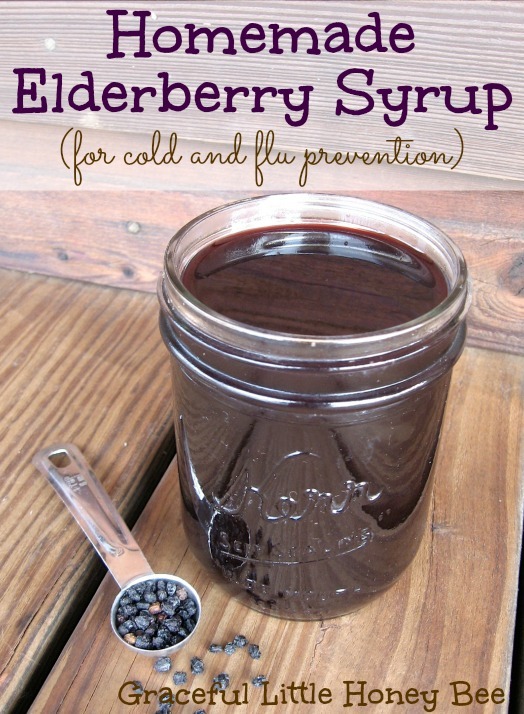 Elderberry syrup is one of my husband's favorite "tonics" and remedies for what ails him in the wintertime! I will be making this from now on! My grandmother made this and rosehip syrup. We got one or the other in a large serving spoon full every morning during the winter. We were rarely ill. She made elderflower cordial and dandelion and burdock in the springtime. My brother and I were sent out to gather the flowers while my dad was tasked with digging the roots. Miss my granny, we loved to take our medicine! Sounds wonderful! Do you have her recipes? Could you substitute blueberries? I'm in the south and have tons. Will this syrup be watery or thick like store bought? It's pretty runny, but you can always cook it down until you reach the desired consistency. This is one of few recipes that includes apple cider vinegar. I would imagine that effects the taste some. Are the benefits worth adding it? Also, I made a batch for myself and my sister and this awful flu this both of our homes...I’m so glad I had it on hand. Thank you so much for sharing! I just made this recipe. Very good! I could hardly wait to try it once I made it, as I've been sick with flu symptoms. I used 100% raw organic honey (Naturally Healthy Mountain Ridge, from Wal-mart) just to test the recipe. Good recipe! I just made this. Than you for sharing your recipe!